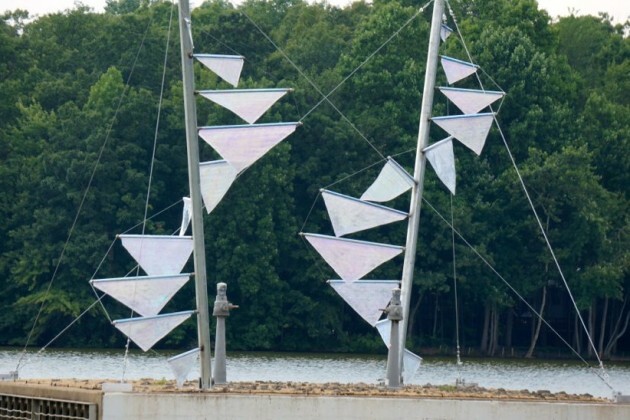 Students from South Lakes High School’s art program and the Initiative for Public Art Reston formally dedicated a new public art sculpture on the Lake Thoreau spillway on Monday. The project is a culmination of a school year’s worth of work by the SLHS “STEAM Team,” says SLHS art teacher Marco Rando. The “STEAM” stands for Science, Technology, Engineering, Art and Math, and this year’s sculpture combines all those elements. The piece is called Nothing Twice and represents the double helix of DNA, said Rando. The sculpture is made of galvanized steel, Strataglass (clear vinyl, iridescent film), and galvanized wire rope. The students worked with a structural engineer, as well as with sculptor Mary Ann Mears, whose giant, yellow Reston Rondo was installed in front of the Hyatt Regency Reston in 2014. Rando hopes the structure can stay in place until next spring. 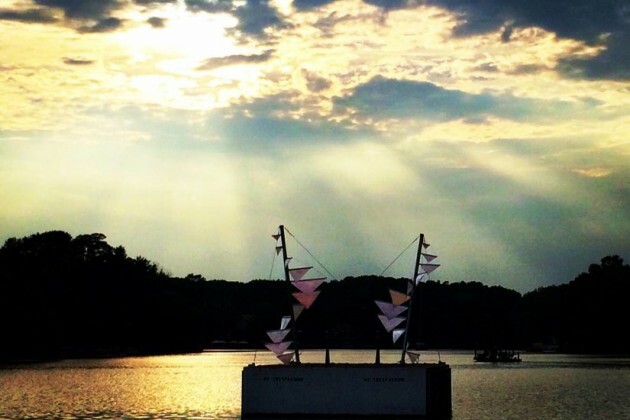 Nothing Twice is a follow-up to the inaugural SLHS public art project, Pyramid of Light, which received many community kudos when it was installed on the spillway in 2014. 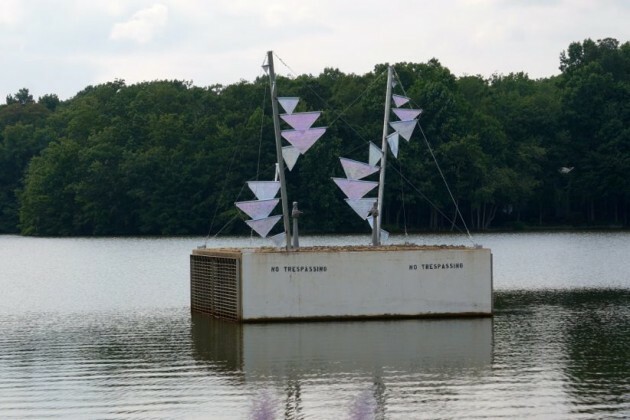 Rando and IPAR officials both said at Monday’s ceremony they hope to expand the program to other Reston lakes. The program depends on community support, and residents can make a donation to the program on IPAR’s website. Members of the STEAM team are Darya Kharabi, Margaret Lashley, Tehmeena Salahin, Jonathan Doctor, Victoria Slaski, Carson Bush, Kathleen Roherty, Melissa Hadley and Ryan Monaco.